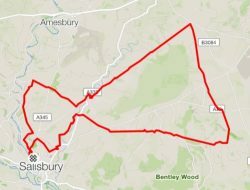 A challenging 34 mile ride taking in some sharp climbs and steeper descents. Heading out Via Old Sarum and High Post down the roads to Gomeldon. From Gomeldon head out on the roads to Porton and pick up the railway line to Grately. From Grateley head across through the Wallops and over the A30 taking in a steep chalky climb to meet the Clarendon Way outside Winterslow. From Winterslow a series of byways takes you to a rocky descent down to Pitton. A rooty trail out of Pitton takes you over the A30 to Figsbury rings for a photo opportunity. Heading down from Figsbury rings will test your nerve before you head back to five rivers via Ford, Bishopdown Farm and St Marks Hill.